The 2 graphics below are of a letter that is going out to ARWorks beneficiaries who had their coverage closed last week. It contains options for them going forward. On July 30, 1965, President Lyndon Johnson signed Medicare and Medicaid into law. For 53 years, it has served as a safety net for millions of people in times of health and financial hardship. Let’s celebrate Medicaid by sharing why you’re thankful for it! What has Medicaid done for you, a friend, or a loved one? Note: Many of these may be shared, so you don’t have to put your whole name. You can include a link to your photo, such as one you’ve shared publicly on your social media profile. The ability to live freely in the community has been questioned, according to this article, by a top official with the US Department of Health and Human Services, enough to alarm a group of Congressmen. They formed a bipartisan group and took action. Even when things are quiet in the news, someone in power is thinking these things. Maybe they want to save money, or possibly they think less of people with disabilities. Some in power think they have the means to change these protections. We need to always be communicating to our legislators why we want to live in the community or why we want our loved ones out in the community instead of institutions. We need to know our rights and assert them! Take a moment to make our Congressmen understand how much living in the community means to us. They are the ones who would have to fight a battle that threatens the ADA. Contact any US elected official! Make sure you’re aware of these differences. For example, TEFRA is an optional waiver that not all states carry, and if they do, they don’t utilize it the same. For example in Arkansas, if a child meets the health requirements, it is accessible for families, no matter their income, on a sliding pay scale. However, the way we understand its application may be specific to Arkansas. If you move, you may not have TEFRA at all. So how can you know what’s available to you? Use the resources below to find out more about Medicaid and how it’s different across the US! Why is Medicaid different in each state? What is a “state plan”? What are the types of waivers? What if your state has limited resources? There may be more out there than you know. Look around at state and local resources. There are national programs, state benefits, foundations, organizations, and grants that may help you in a bind. For example, check out this list of foundations that assist for children’s special needs. If Medicaid matters to you, please constantly tell your elected officials. The trend is to cut Medicaid and provide those funds elsewhere. Get the facts to boost your confidence, but don’t stop communicating! Tell your legislators why Medicaid saves you! Here are some ways we could see Medicaid change in coming years. Each link leads to a different resource we’ve found to try to help you with info or tangible resources. MSL will add to this list as we find more! H.R. 620 – Should you take action? The Disability community is calling far and wide for people to take action against H.R. 620, saying that it is a bill that “fundamentally weakens the protections of the American with Disabilities Act.” Here are some resources to help you determine if it affects you or someone you love, as well as resources to help you to take action! Does this affect you or someone you love? See which organizations have united to oppose it. “Please contact your House Representative(and others from your state) and encourage them to stay strong in their opposition to H.R.620 and any “notice and cure” bill, as a rollback of civil rights. SAVE THE ADA! Go to Contacting Congress using your zip code to find out how to reach your House representative via e-mail, phone, Facebook, Twitter, fax, etc. Call your Representative using the U.S. Capitol Switchboard at (202) 224-3121. They will help you find your Representative’s name, and switch you to their office. If you know your Representative’s name, you can use the House of Representatives phone list. H.R. 620 would weaken the civil rights of people with disabilities, making it harder for us to use the same restrooms, shop at the same department stores, and eat at the same restaurants as our non-disabled friends, family members, and peers. Disability rights are civil rights. The ADA is a civil rights law. H.R. 620 would not only roll back important parts of the ADA, it would pose risks for other civil rights laws as well (such as Title II of the Civil Rights Act of 1964, which bars public accommodations such as hotels, restaurants, and entertainment venues from discriminating based on race; Title III of the ADA was based on this law). How to make sure Congress is listening to you. Watch the video above to get all of the contact information to get contact information and tips. Are you thankful for Medicaid? It’s customary this time of year to count our blessings, and there’s one in particular that millions of Americans shouldn’t forget: Medicaid. If you’re a recipient (or know a recipient), think for a second what your life would be like without Medicaid. My little girl qualifies for TEFRA because of her diagnosis, and she’s thriving because Medicaid gives her treatments like therapy and medicines that we simply can’t afford. Medicaid not only helps her day-to-day, but it’s also giving her a future where she may someday be able to live on her own and provide for herself. Because of Medicaid, she can climb stairs, say that she wants a drink, draw a line, feed herself with a spoon, and sit quietly with other students around a table. When I think of life without Medicaid, I see many who would be crushed under personal debt and suffering without hope. If you’re thankful for Medicaid, please tell those who make our state and national policies, especially if you need to continue receiving it. This is the perfect time of year to let our lawmakers know that we’re thankful for Medicaid. Why? Because it’s improving and even saving lives! I ask you to take a moment, and write your elected officials a note. Even better, include a photo. Tell them why Medicaid is important to you. If writing several is overwhelming, just start with one. You can also post on social media about why Medicaid is important to you using the hashtag #thankful4Medicaid to help others see why Medicaid is so important. We need to tell everyone the great things that Medicaid does and who it helps. People need to hear this positive message. By sending notes, calling, and posting on social media, we are clearly communicating that we still need Medicaid, and we’re directly asking the people in charge to continue funding Medicaid for us. Let’s flood our government with letters and calls this holiday season! Contact any elected official in the US! Taxes affect our daily lives, and the House is working on a bill to “reform the tax code.” If taxes are drastically altered, it won’t just affect our personal taxes; Medicaid funding could be affected as well. For example, Senator Cotton called for the repeal of the Obamacare individual mandate through tax reform. That’s why it’s so important to stay on top of what’s happening. 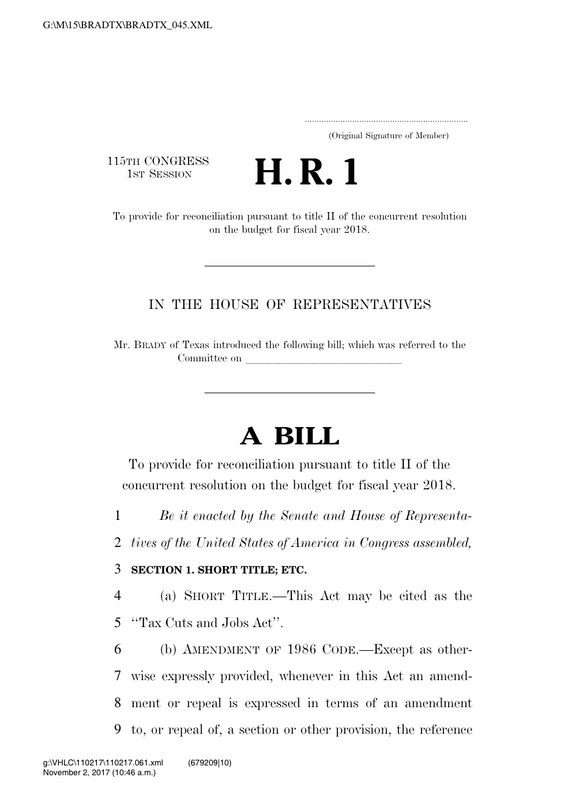 A House committee released the bill, the “Tax Cuts and Jobs Act,” this afternoon, and it’s a very long read. This is just a first version. They will revise the bill and try to pass it through the House by Thanksgiving to send to the Senate in order for it to take affect by January 1, 2018. What is this and what’s next? Make sure you understand this for yourself, and contact your U.S. Senators with your questions, concerns, and comments!